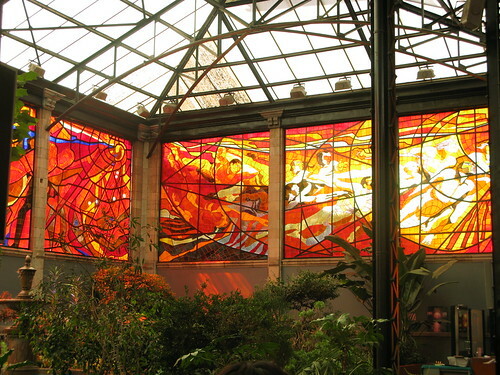 Sometimes back I had made a post about Magnificent Stained Glass Winter Garden at the Ursuline Institute, Belgium. 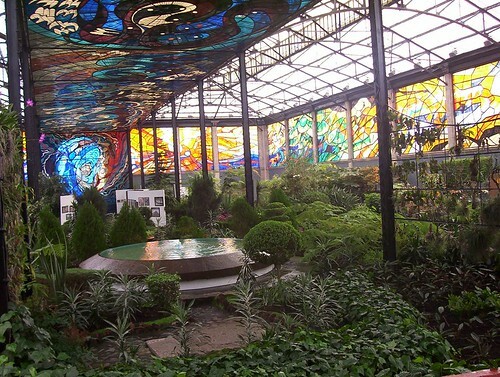 I now present "Cosmovitral" a much larger and beautiful stained glasshouse botanical garden in the Town of Toluca, Mexico. 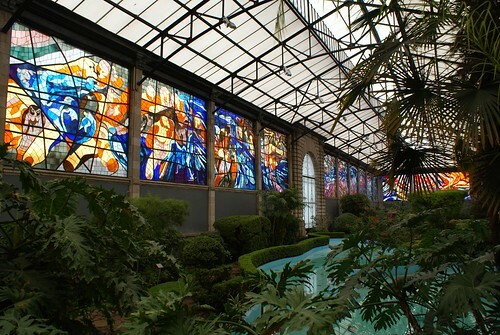 The beauty of the building lies in the exquisite coloured glass murals on large sized windows all along the four sides of the wall as well as on the glass roof. The windows are reportedly the largest of their kind in the world. 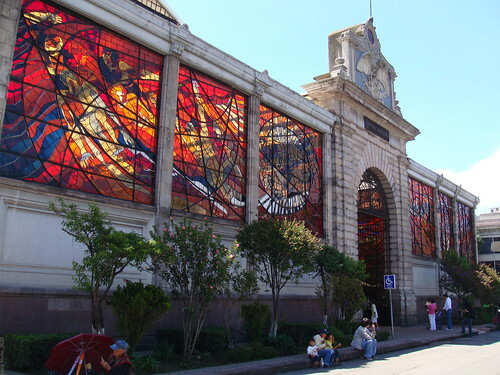 The large building having an area of 5000 sq metres (~54,000 sq feet) was originally a covered market built around 1910 on the first centenary of Mexico and was known as 16th September Market (Mercado 16 de Septiembre). 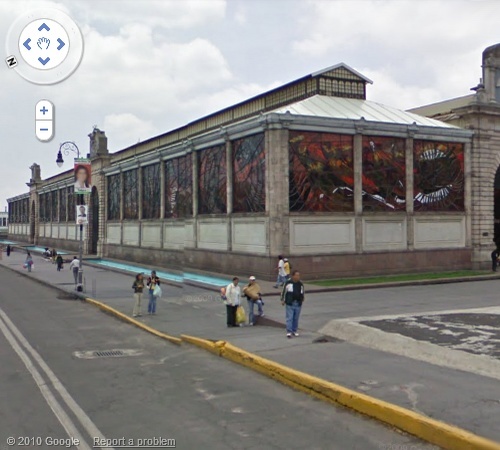 It was closed in 1975 and was awaiting demolition; however Leopoldo Flores a Mexican muralist, sculptor and intellectual convinced the city authorities that instead of selling to private developers it should be converted into an art building with a botanical garden within it. 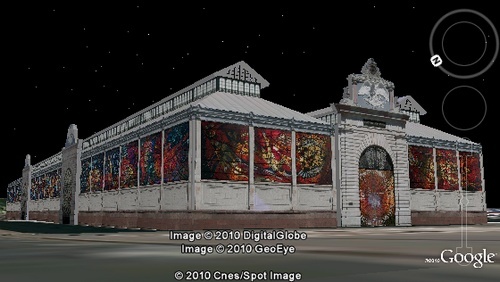 Thus Cosmovitral was born, which is an amalgam of "Cosmos" and "Vitral" (Spanish for glass) - The name is commonly used for the building as well as for the artwork. Main theme of the art work is "Man and his relationship with the universe" with emphasis on universal dualities and antagonisms, the struggle between life and death, good and evil, day and night and creation and destruction in a cosmic continuum. 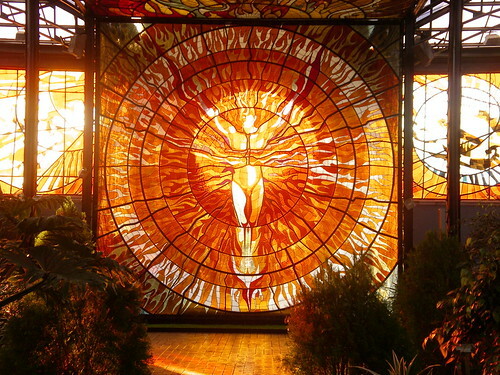 The central focus of the artwork is a huge yellow-reddish orange panel on the east face with image of a man within a fiery sun. This panel is known as the “Hombre Sol” or Sun Man. As per Wikipedia "The image represents mankind in perfect harmony with the forces of creation, virtue, art, science, truth, beauty, wisdom and other qualities." Each year on the spring equinox, for about 20 minutes in the afternoon, the sun aligns with the 'Hombre Sol' making the image of the 'Sun Man' shine brighter, as if it is on fire. The sun rays also cast a shadow of the man on the floor, which is reflected on to the coloured panels of the roof by means of mirror. 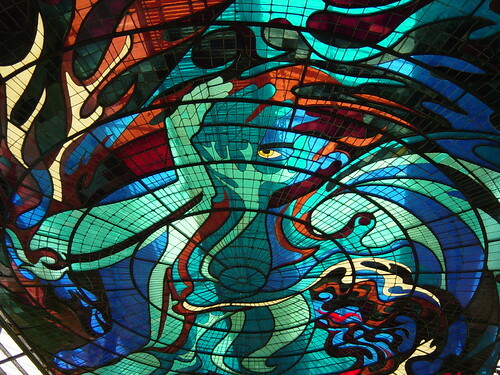 Opened in 1980 the Cosmovitral murals consists of 71 modules which cover an area of about 3,200 sq. meters. The murals were created by using about 45 tons of blown glass consisting of about 500,000 glass pieces ranging in size from 15 to 45 cm. Twenty eight different colours of glass mostly from Italy, Germany, France, Belgium, Japan, Canada and USA have been used. The glasshouse garden contains over 500 species of plants, mainly from Mexico and few plant species from other parts of the World. Cosmovitral is one of the best and a classical example how an old decaying building can be converted into an exquisite show piece. All kudos to the then civic authorities of the town who didn't yield to the temptation of developing it into a commercial space. I wish there were more such authorities around the World, specially in the developing countries where commercialisation takes a very high priority over preservation or conversion to something beautiful. 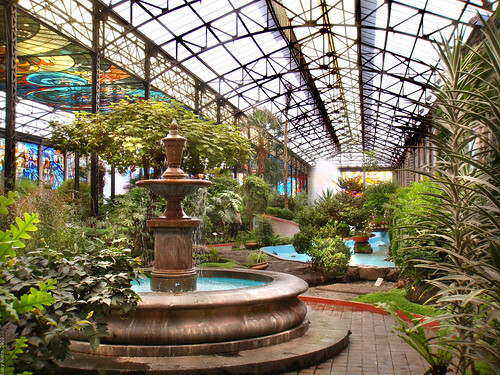 Some more fantastic images can be seen in Flickr photoset entitled Cosmovitral (Toluca) by Lucy Nieto.